This is crazy for me. I did not realize that we need to paint plein air in the night during PAE. I didn't know what I was doing, but I did it anyway. I was not sure what color to use because I can't see. However, I looked the painting the day after, it looks better than I thought. 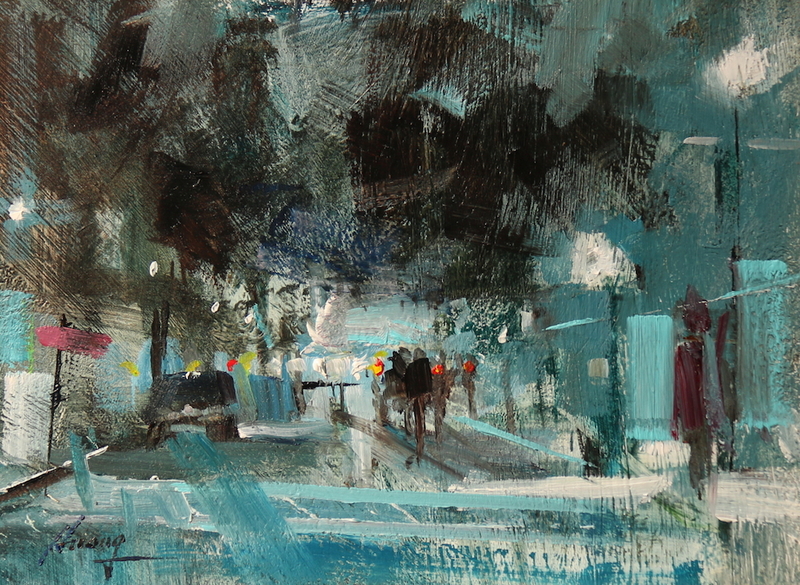 This small painting is the only one I did that didn't sell at the Plein Air Easton Festival. I gave the painting to my hosting family Richard Caroll to think him for supporting me by offering his lovely place for us to stay. I want to thank other volunteers who helped Plein Air Easton 2017 as well. Without all those people who generously provided their time and effort during the festival. 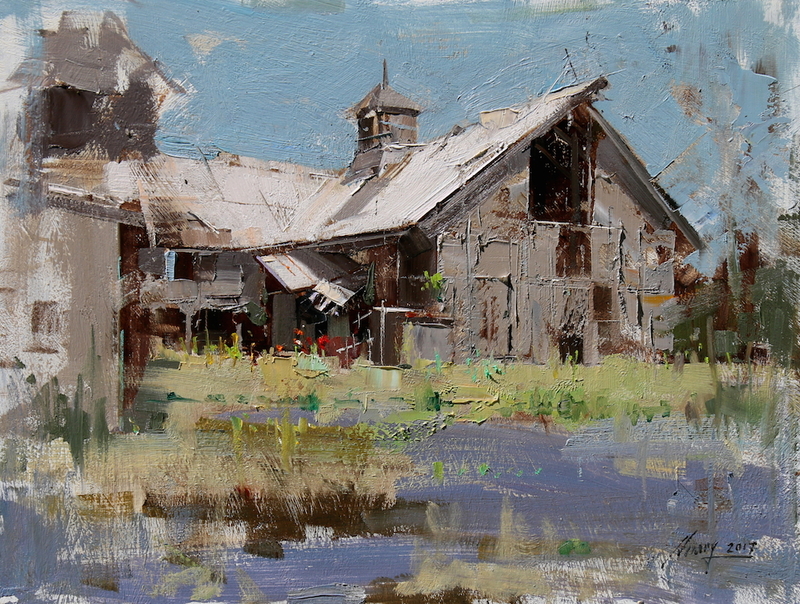 Plein Air Easton would not be possible. "Old Point" is the name of a boat being build at the St Michaels Maritime Museum. Many PAE artists painted this boat. It was a busy site. whole bunch of lumber piled up under the "Old Point". I thought it is very difficult to paint them, but the result was not bad. 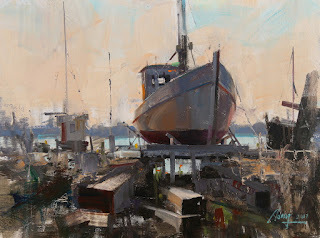 During the Plein Air Easton Festival, I was so impressed with how some of artists worked. They arrived at the painting locations very early like 5 or 6 AM, and set up very large canvas. They were able to paint 3 or more paintings each day. they even painted after dark as well. The weather was brutal: 90s with almost 100% humidity, but so many artists still worked under the steamy sun. I was so unexperienced. I got up about 8, having coffee with my host family. When I arrived at the painting site. Quite a few artists have done their large pieces. Now I understood what it means by "painting seriously". Plein Air Easton 2017 ended yesterday. I painted 10 paintings and sold 9 of them. I did not get any awards. That is all right. I surely enjoyed very much this 9 days festival. These are two 12" x 24" I painted at Oxford and St. Michaels. This was my first time painting large paintings live at the sites. It was quite challenging. I have stepped into many unknown zones of plein air painting. I have learned a lot from many experienced plein air painters this time. 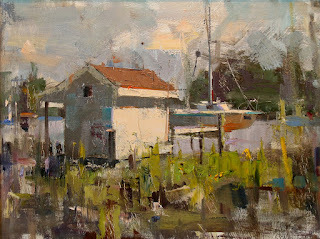 My very first Plein Air Festival - Plein Air Easton started. I am so happy to gain new painting experience at this new event. I was shocked that most of participating artists started painting in very early hours, and keep on paining after dark. They can crank multiple paintings per day. The weather is not cooperating. It is hot and humid. But artists working hard under the sun. The event is very well organized. I feel very fortunate to get in. This is my first painting. I started around 4 PM finished about 7 PM. framed (with the only frame I brought) and displayed on my easel. Collectors came. The painting sold pretty quickly. Nancy Tankersley is one of the artists I really admire. Being able to painting loose but accurate is not easy. Nancy knows the secrets and she will share them with us in her painting workshops. Many artists who had taken her classes expressed to me that her methods are very practical and effective. Figurative art can be quite challenge to many beginning and intermedium level artists. I highly recommend Nancy's workshop to you. 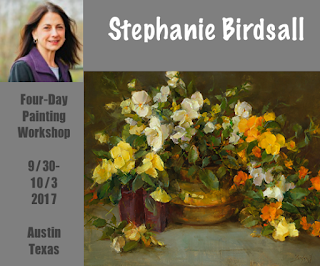 She is coming back to Austin this fall and teach a four day workshop. 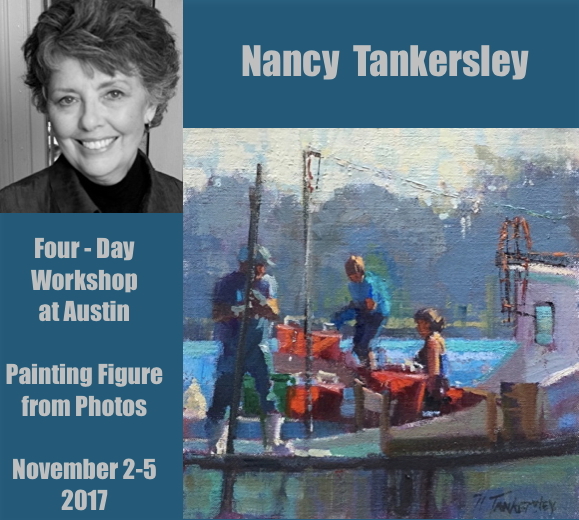 Please click: Nancy Tankersley Workshop for detailed information and sign up. We only have very few openings. 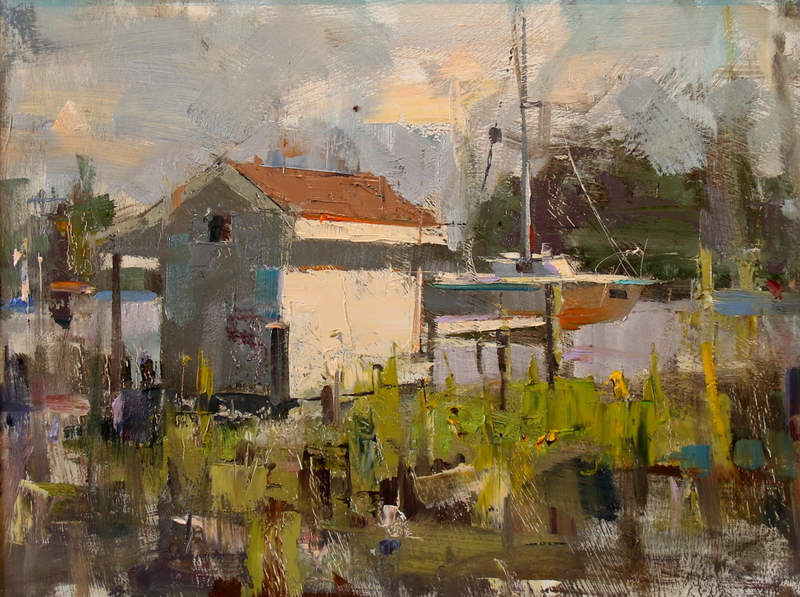 In addition, Nancy is one of the major artists who started the Plein Air Easton Art Festival. It has become one of highly prestigious plein air events in the country. I am lucky to get in this year as a newbie, and looking forward to paint together with Nancy and other well known artists. My usual workshop demo. I did this one on the last day at St Simons Island workshop. The flowers are not bad, but I really like the color relationship between the background and the white vase. I am very happy to announce that the well known artist Stephanie Birdsall will come back to Austin and teach a 4-day floral and still life painting workshop from September 30 to October 3, 2017. Stephanie is a good friend of mine. We met many years ago at one of the Putney Painter's event. She is excellent in both oil and pastel. She has taught a 2-day workshop earlier this year. Quite a few Austin artists have attended and learned a lot. I am so happy she is coming back. Please check Stephanie's workshop webpage to get detailed information and sign up. It has been 3 days I paint everyday at my home studio. I want to see if it is possible I can paint relatively large and manage to finish in a few hours. This one is a 12x16. I finish of this one in about 3 hours. I am kind of practice my daily painting exercises again, but in relatively large scale. So far so good. 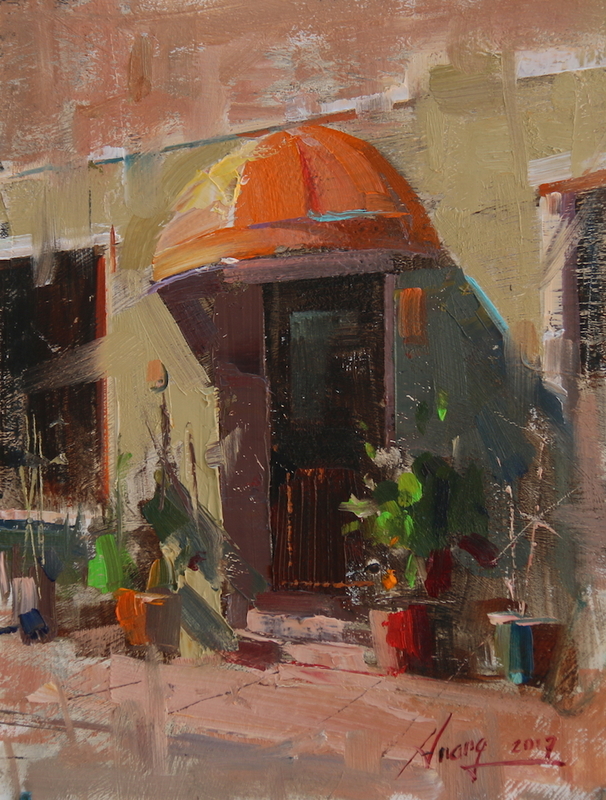 In about 10 days, I will participate the Easton Plein Air Festival. This is my first time to get in. So I want to prepare a little. This one is from a photo I took at St. Michaels, MD. In the coming festival, I may go there again.